Hint: Click on the picture to see it in full resolution. You can pan the full resolution image with the mouse. The name Sail Boat Cluster (NGC 225) was given to the open cluster located in the constellation of Cassiopeia by Rod Pommier, referring to the visual appearance of the object. There are a lot of gas and dust clouds around the cluster, part of which is being lit by the nearby cluster members, making it shine in blue. The cluster was discovered by Caroline Herschel in 1783, who entered the object as #11 on her private list of deep-sky objects. A few months later, in 1784, as a mistake, she discovered it again, and listed it again as object #15 on her list. The cluster visible in the constellation of Cassiopeia is a bit more than 2000 light-years away from us, by that distance the cluster is considered one of the nearby clusters to us. Open clusters play key role in better understanding the Universe. Because their stars form a compact unit both in time and space, they provide a good opportunity for statistical measurements. For example by being compact units in time (stars of a cluster bore approximately at the same time) star clusters help astronomers to reveal the relation between stellar evolution and physical parameters of stars, while compactness in space is helpful during distance measurements. In astronomy determining the distance of objects is usually possible by indirect methods only. One of the indirect methods for example is using standard candles, like objects whose absolute luminosity can be calculated from other, measurable physical parameters. For example in case of certain types of variable stars their absolute luminosity can be determined based on the period of variation. The distance of an object can be calculated easily using the difference of its absolute luminosity and apparent (measured) luminosity. This kind of indirect methods need be verified and tuned using objects whose distance can be measured directly as well. One of the direct distance measurement methods is the parallax method. It is based on the fact that object being at different distances appears at different angles when observed from different places. Nearby objects and stars seem to be displaced relative to distant stars in the background, the amount of apparent displacement is a function of the distance of the object, and the distance between the location of observations. Closer the object and bigger the baseline of observations results greater apparent displacement. Traditionally such measurements are made on two opposite points of Earth's orbit around the Sun, but even with that huge baseline the apparent displacements are measured in fractions of an arcsecond. (Only 0.8 arcseconds in case of the nearest star, Proxima Centauri which is located 4 light-years from us.) Two factors make such measurements difficult. One is the relative velocity of stars, which can result significant real displacements during the half year elapsed between the measurements. The other factor is the error in measurement of very small angles. The effect of these factors can be reduced using statistical methods, but those methods requires stars that are known to be at the same distance and are visible in the same direction. Stars of open clusters meet both criteria. When the distance of an open cluster can be determined using the parallax method, and there are standard candles in it which make indirect distance-determination possible, the results can be compared to each other, the accuracy of the indirect method can be verified, and the method itself can be fine-tuned if needed. 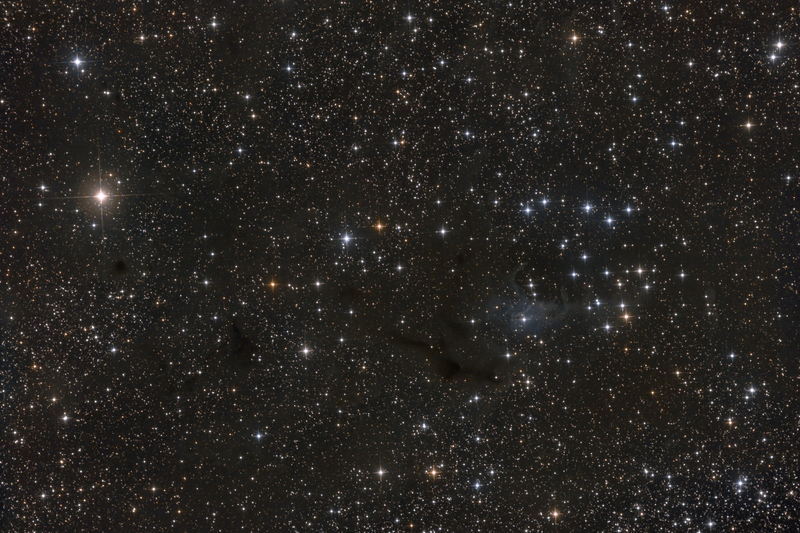 A nebulosity consisting of dark gas and dust clouds can also be found in the picture. This nebulosity shines blue close to the cluster, reflecting the blue light of the nearby cluster members. The reflection nebula was discovered by Sidney van den Bergh, Canadian astronomer who entered the nebula in his catalogue under number 4. Except where otherwise noted, content on this site is licensed under a Creative Commons Attribution, Non-Commercial, No Derivative Works CC BY-NC-ND Licence.